Ok. So I just had the most amazing three weeks travelling through France, Italy and England with my husband. It was my first ever trip to Europe which I immediately fell in love with. The history, the architecture, the people, the culture, and the food were just amazing. Everything I had imagined and more! I’ll be sure to share with you all of my food discoveries, special finds and newly inspired recipes very soon. While preparing and packing for the trip I put together some healthy snack alternatives for the long 30 hour flight over. One of them was this super easy, quick to prepare, trail mix recipe. It’s definitely a winner! Full of variety and easy to snack on in any environment. I love the mix of nuts combined with the lush dried fruit, especially the sliced pears and turkish apricots, which make the perfect chewy addition to the mix. I also like to add in cacao nibs for a ‘chocolate' cacao hit. 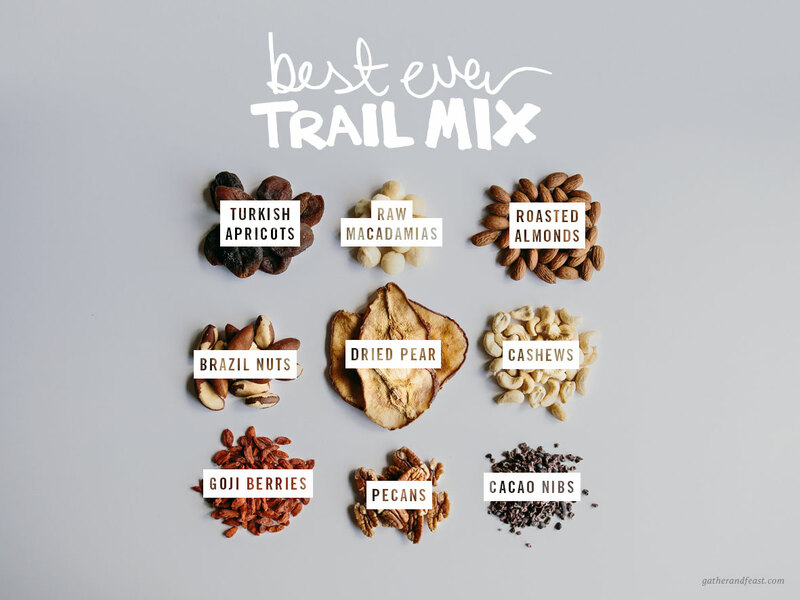 What’s your favourite addition to a trail mix? PS: I like to buy organic dried fruit with no added preservatives. The dried apricots don’t look as bright, but believe me, they taste a million times better and with no sulphate aftertaste. I usually buy the ‘Macro’ brand organic turkish apricots and sliced pears. ​I like to buy organic dried fruit with no added preservatives. The dried apricots don’t look as bright, but believe me, they taste a million times better. I usually buy the ‘Macro’ brand organic turkish apricots and sliced pears. Mix together equal quantities of fruit and nuts, then add the gojis and cacao nibs. I would probably add ½ a cup of each fruit and nut and a couple of tbs of gojis and cacao nibs. Store in an airtight jar or pack into a brown paper bag for the perfect snack on the go! While wandering through my favourite little gourmet grocer the other week, I came across the sweetest spring vegetables. These salted honey millet bars are the perfect sweet treat and also contain great nutritional value! I was inspired to create a little something adventurous this week!